The Bigfoot community is in mourning early in June 2016, with the news that the "World’s Leading Sasquatch Researcher and Chronicler John Green Has Died (1927 – 2016)." Coincidentally, the date that John Green died, May 28, 2016, also happened to be the birthday of Tom Yamarone, the Bigfoot songster (born May 28, 1961, Port Chester, NY, at 4:15 a.m.). 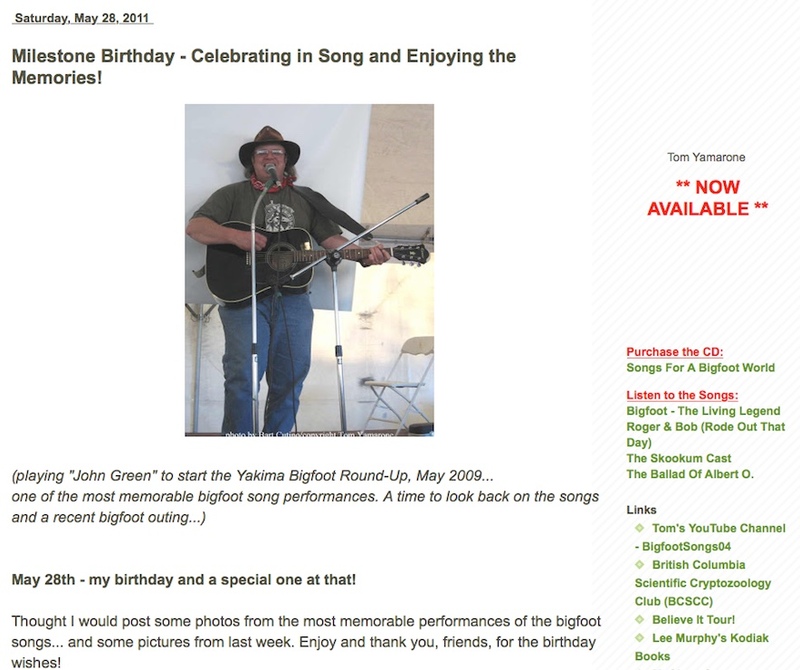 In a remarkable instance of bizarre foreshadowing, five year ago, Yamarone told on his blog of starting off the Yakima Bigfoot Round-Up with his new song, John Green. The date he decided to recall this - May 28, 2011. Have there been special Sasquatch events occurring at this time of year? Historically, we do know late May was significant in British Columbia, regarding Sasquatch and the Native Peoples. Indian Agent J. W. Burns (who coined the term "Sasquatch") recorded how the local First Nations people felt their Forest Giants were very real, during the May 23, 1938 celebration of a festival known as “Indian Sasquatch Days,” held at Harrison Hot Springs, British Columbia. Harrison Hot Springs was where John Green called home, and was later elected mayor there. 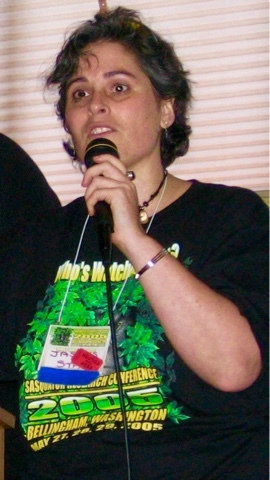 Tom Yarmarone points out that, "The most significant Bigfoot/Sasquatch event on May 28th was the Sasquatch Research Conference in Bellingham, Washington,” in 2005. It was Yarmorone's first trip to a conference with Bob Gimlin - along with Scott McClean, Cliff Barackman and James "Bobo" Fay. He performed three Bigfoot songs that day and had a birthday lunch with the above mentioned friends and Thom Powell and Tom Cousino. I, Loren Coleman, was also there and that was the first meeting we had, and the same for Tom and John Kirk, Ron Morehead and Al Berry. In attendance was Jeff Meldrum, John Bindernagel, M.K. Davis, and Autumn Williams. 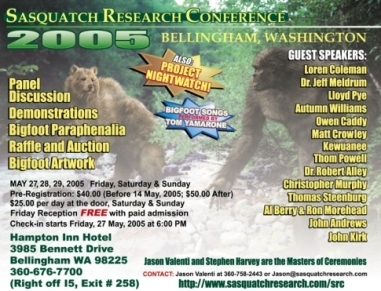 Jason Valenti and Star Sams had organized the Sasquatch Research Conference held at Bellingham, Washington, on May 27-29, 2005. The event was successfully hosted by Jason Valenti and Star Sams (pictured), along with assistance from Paul Smith and others. I was happy to be one of their guests and speak at the gathering. Sadly, the terrible news reached the Bigfoot community the next year that Jason’s partner, Star, was killed in a tragic car crash on August 15, 2006. A Bellingham woman died Wednesday evening when her car plunged off the side of Chuckanut Drive, according to the Washington State Patrol. Star C. Sams, 37, was driving her sport utility vehicle south on Chuckanut near the Whatcom County line with Skagit County about 7:30 p.m.
Near the Clayton Beach trailhead, where the road curves to the left, her vehicle didn’t make the turn. Instead it went right, traveling off the road and down the cliff, according to the State Patrol. Rescuers made their way to the car but found Sams already dead. No one else was in the vehicle. Now John Green is gone. His legacy lives on. And he leaves much to ponder in the research he did. One thing he seems to have proven: There is no Bigfoot curse. Nevertheless, Green was squarely in the middle of revealing that this "Sasquatch hex" actually existed. That is the "curse" was part of the folklore discussed, and Green was the one who seems to have first chronicled it for the English-reading world. As I observed in my book, Bigfoot: The True Story of Apes in America (2003), some people believe, "To encounter a Bigfoot is to die." For others that might be translated into "to study Bigfoot is to die." This early consideration grew out of one often-told story by John Green (who was born February 12, 1927). Writing about the Ruby Creek incident of 1941, Green, who was the first to chronicle it, mentioned that for “an Indian to see a Sasquatch was believed to be bad luck, in fact the observer was in danger of dying." Is there any reality to this sense of bad luck, death, seeing or even studying Bigfoot? The Patterson-Gimlin film footage was taken in October 1967; Roger Patterson died in January 1972. The Skookum cast was found in 2000, and Fisher and Krantz died in 2002. The Chapmans had their sighting in 1941 and died in 1959--about 18 years later - although the point Sanderson was making is that relatively soon after he interviewed them they died. The folklore lives on. The theme of Mizokami’s article is that his association with Bigfoot ruined his social life and "no one will take him seriously anymore." People die. It is part of the human condition. In actuality, there is no "Sasquatch death curse." There is only sadness that we have no control of when death occurs. And that someone has moved on. John Green got involved in serious Sasquatch research in 1956. He died 60 years later. The "Bigfoot curse" never touched him, except in a positive fashion. 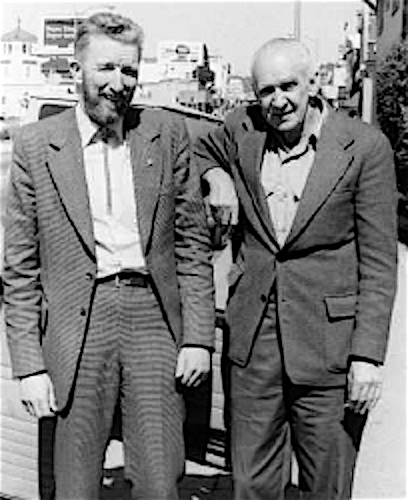 At top, John Green (left) and George Haas of Oakland, California. George Haas, 72, died February 22, 1978. Haas’ widely distributed newsletter, The Bigfoot Bulletin, was first issued on January 2, 1969. See a sample of the newsletter’s discussion of pounding rock. Jim McClarin produced a two-year Manimals Newsletter and Warren Thompson kept a news exchange (The Bigfoot Bibliography) going between Bigfoot researchers, via the mails, for a few years.